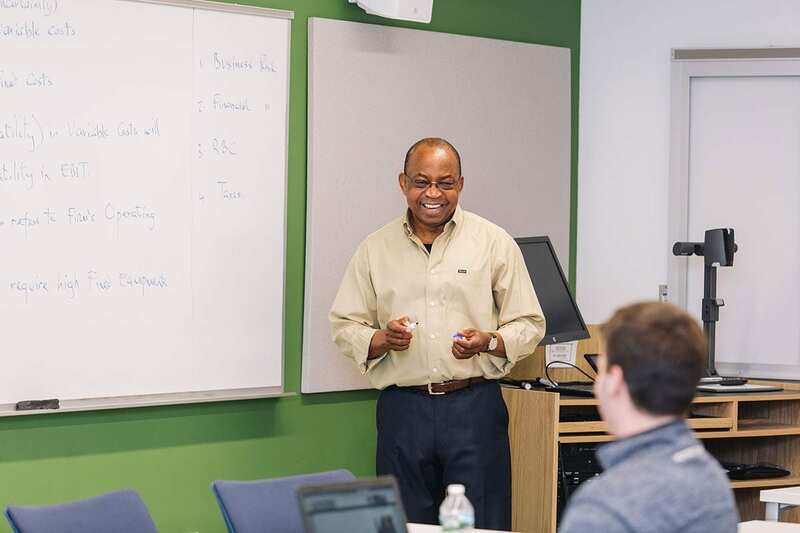 PC School of Business undergraduate program ranked among best in U.S.
Dr. Vivian Okere leads an undergraduate finance class in the Arthur F. and Patricia Ryan Center for Business Studies. The Providence College School of Business continues to hold its place among the best undergraduate business programs in the country, now according to a comprehensive ranking published by Poets & Quants for Undergrads. That online publication’s assessment places PCSB at #63 among only 82 that made the ranking. AACSB International (the Association for the Advancement of Collegiate Schools of Business) provides accreditation to more than 500 U.S. schools, including PCSB. There are a great many more unaccredited programs at colleges and universities throughout the country. This is the second year that Poets & Quants has published its list. Using a methodology developed in collaboration with business school deans and administrators, it measures equally admission standards, academic excellence, and employment outcomes. Results are based on a survey of recent graduates and school-reported data. Bloomberg Businessweek published a similar list until early 2016, when that publication stopped ranking business schools. PCSB was #61 in that survey, up from #75 in 2015. In January, PCSB will celebrate the one-year anniversary of its move into the Arthur F. and Patricia Ryan Center for Business Studies, a state-of-the-art building that provides faculty and students with the tools they need for teaching and learning at the highest level. The school recently welcomed three new professors to its extraordinary faculty, and the four undergraduate business concentrations (accountancy, finance, marketing, and management) are each among the College’s most popular majors.